Coca-Cola Nepal has launched a music contest to create a Nepali version of the official Coca-Cola anthem for the FIFA World Cup Trophy Tour- ‘The World is Ours’. ‘Coca-Cola has partnered with the popular Nepali rock band 1974 AD to collaborate with the winning band and create a special Nepali version of the official anthem. The competition began on November 23, 2013 and will end on December 20, 2013. Bands from across Nepal can participate in the contest by sending in their own band’s composition in a C.D. to IMAGE FM, Lazimpat till December 2, 2013. In Round 1,1974 AD will chose the top 10 bands from all the entries and the names will be announced on the radio. The 10 bands will be given pre-defined lyrics to create their own versions of the official Coca-Cola Anthem. In Round 2, 1974 AD will further select the top 3 bands out of the 10 shortlisted bands in creating the Nepal-version of the Coca-Cola anthem for the FIFA World Cup Trophy Tour. In Round 3, the three anthems will be aired on IMAGE FM for the public to vote. The winning anthem will be announced on December 20, 2013, based on public votes, the decision of an expert panel and 1974 AD’s inputs. Coca-Cola is building a legacy of music for the FIFA World Cup to create an amazing music story together with FIFA. 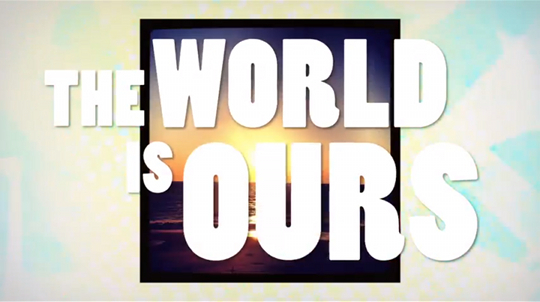 ‘The World is Ours’, sung by Brazilian singer David Correy with music from popular Brazilian band Monobloco, communicates the power of striving to achieve your dreams.